Mouseless is an invisible working computer mouse built by MIT PhD student Pranav Mistry , He loves creating new ways of using and interacting with computers – he was the one who created SixthSense, The mouse, or lack thereof, is controlled by using your hand with no hardware to control the pointer on your screen. This technology would allow for a wide range of interactions between the user and their computer, the ability to wake the computer from sleep, control volume, brightness, and of course gaming, to name a few applications. Using an IR laser, an IR camera and specialized software, Mouseless is able to interpret hand and finger movements. 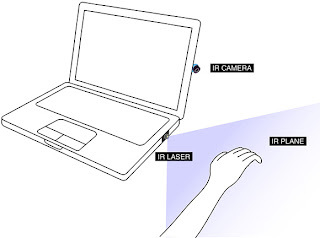 Basically, the laser illuminates parts of the hand that are touching the surface of the table. The camera tracks those illuminated parts, and the software sorts out what kind of commands are being sent, from simple movement to clicks to multi-touch gestures.